Installment #2 in the Instagram for Art’s Sake series. A tree fern in the garden of the Lucky 5 Star. 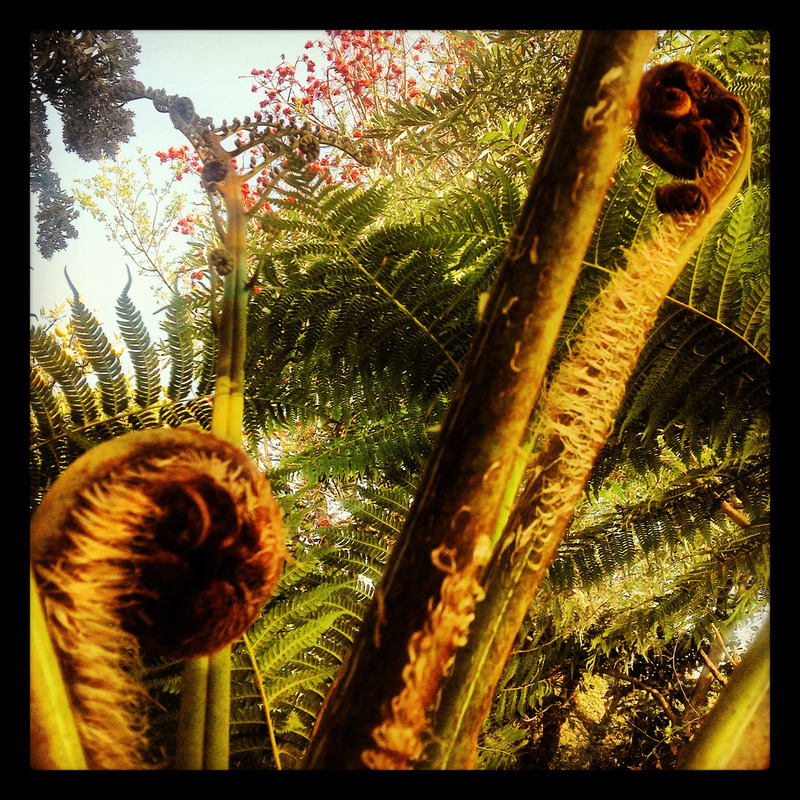 New fronds are in the foreground, old fronds are in the background. I love the way this tree fern grows in spring. The new branches look like snails at first, curled up tight inside their shells. Then the branches slowly unfurl, revealing dozens more tiny green snails that eventually become fronds. It’s such a simple, elegant way to grow and develop. I aspire to grow like a tree fern. I accidentally captured a glimpse of flaming orange-red lucky bean tree (otherwise known as coral tree) flowers at the top of the frame. I forgot to mention previously that if you want to follow me on Instagram, my username is 2summers. Unfortunately you can only follow Instagram if you have an Instagram-friendly device, such as an iPhone, iPad, or Android phone. More Instagram art coming soon. I’m thinking dinosaurs must be lurking around the corner! It does appear that way, doesn’t it?